Easter’s coming, the musicians are warming up and the weather’s going to be great –I hope! And that makes it time to celebrate before winter is upon us. How and why chocolate, eggs and bunny rabbits ended up being associated with Easter I have no idea. But on the basis that we barely need an excuse to eat chocolate, so I say bring out all the good stuff. 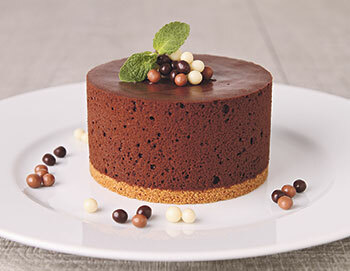 This recipe is made up of the most wonderful sunken chocolate cake and quite simply the best chocolate mousse in the world. Separately they are both great, but together they will knock your socks off. The difference in textures makes this one of the most decadent desserts you will ever eat and with the sharpness of a raspberry coulis, simply divine. The big trick with this one is to use the best chocolate you can find, at least 70 per cent cocoa solid. If you ignore the commercial brands and don’t want to use imported brands, then try Whittaker’s, or, if you can find it, Donovan’s Chocolate from Hamilton. You’ll also notice we’re using raw eggs in the mousse, so best to use the freshest organic eggs you can. Serves 10 for a dinner party or less if you’re taking sneaky spoonfuls from the fridge. Preheat oven to 180 degrees Celsius. Brush a 20cm springform cake tin with butter and dust with some ground almonds. Melt the chocolate, sugar, butter and salt in a large bowl over boiling water. Whisk the eggs with the ground almonds and fold into the chocolate mixture off the heat until it thickens. Pour into the prepared cake tin and bake for 35-40 minutes. Leave to cool for a couple of hours before starting the mousse. For the mousse, place broken chocolate in a heatproof bowl and melt in the microwave. It should take about three minutes but keep checking every 20 seconds with a fork. When melted, beat in the butter until smooth and light. In a separate bowl, whisk the egg whites until frothy, then add one tablespoon of the sugar and whisk until stiff. Now slowly add the remaining sugar while whisking all of the time. Beat the meringue mix until strong and elastic, then mix in the egg yolks. Stir half of the egg mix into the chocolate mix, then gently fold in the remainder. Pour mousse over the cooled cake base in the cake tin and refrigerate overnight to set. Remove from the fridge about 15 minutes before serving. Dip a palette knife into boiling water, dry it and slide it around the sides of the cake to loosen it from the tin, then remove the ring. Re-heat the palette knife and gently smooth the side of the mouse. Dust with cocoa before serving and enjoy.